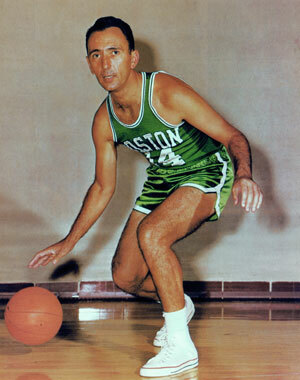 Bob Cousy was the second player ever to win the MVP award, the floor general of the greatest dynasty basketball has ever seen, and the league’s top assist man for eight straight seasons. Like many men from the 50’s and 60’s playing a different game in a different era, Cousy’s efficiency wouldn’t hold up in today’s game. That being said, he took care of business in his own right. He led the playoffs in scoring three straight years, and led the playoffs in assists eight straight years. Cooz had them all guessing. The Flag Bearer: Jacob Noble (12). The Barn Burner: Matt Drappel and Brian Geltzeiler (46). How did the other guys rank Cousy: Justin Termine (21), Adi Joseph (22), Justin Salkin (22), Robert Littal (23), James Holas (23), Marc Griffin (25), Justin Rowan (27), Lang Greene (27), Shane Young (29), Josh Eberley (36), and Will Reeve (43).